Cnidaria is a phylum containing over 10,000 species of animals found mainly in aquatic and marine environments. Their body mostly consists of a non living jelly like substance. The two different forms of a cnidarian are either the polypoid shape or the medusoid shape. they differ from each other based on the directions of their tentacles. Jellyfish are polypoid, free-swimming members of the phylum Cnidaria. Jellyfish are invertebrates. that means they have no bones, exoskeleton, or shell to protect them. the majority of their body is made up of water. The water contributes to their physical support as they float through the water. The top of the jellyfish is known as the bell. Its shape varies. the outer layer consists of an epidermis. They have tentacles that grow out of the bottom and the sides. They are known for their electricity. Coral are medusoid marine animals that are in the phylum cnidaria. Most of the coral population is in large groups at the sea floor. A coral "head" is a colony of myriad genetically similar polyps. Each polyp is a spineless animal typically very small. A set of tentacles surround the mouth opening. An exoskeleton is excreted near the base. Over many generations, the colony creates a large skeleton that is normal of the species. this exoskeleton is effective in protecting them from predators and the elements under the water. The hardness of the skeleton can depend. Hydra is a simple fresh-water animal in the cnidaria phylum possessing the medusoid classification. 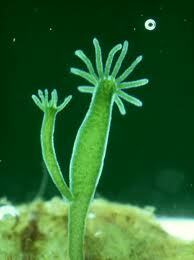 They are multicellular organisms which are usually a few millimetres long and are normally studied with a microscope. Hydra has two body layers separated by mesoglea, a jelly like substance. The outer layer is the epidermis, and the inner layer is the gastrodermis. Like jellyfish, they do not contain an exoskeleton, shell, or bones.